While I wouldn't want the game to become a mess of markers, the occasional unit that uses them doesn't bother me at all. This unit is simple and thematic, and I can see where it could provide some interesting tactical decisions. Jaraptara has received 4 Yea votes to review (Soundwarp SG-1, vegietarian18, superfrog, and Scytale) and moves forward in the process. The fact that she has Reach and the Ogre Pulveriser doesn't is weird when I look at the figures. There are many other figures you could make the argument vs Hydra( Jotun, Nilf...) there are many other instances in the game where powers can be inconsistent. Why do sheildsmiths have 5 def and KoW have 4? Why knights Templar only 3? We can go on and on about these circumstances. For the Stone Giant , it is her fighting style. She utilizes her height and length differently then other units. Viceron the Dark Knight has passed United Fanscape review and moves forward in the process. 1. Any number of units may be nominated in a single post, including "synergistic" units that function best as a group. When nominating multiple units, you may choose one of four options for your submission: a) Choose a unit to be the "primary" unit of the submission, and the rest to be "secondary" units. The "primary" unit may pass by itself without the "secondary" units passing, but if the "primary" unit fails, all "secondary" units will be withdrawn. "Secondary" units will be judged based on the "primary" unit. b) Designate the entire submission as a "faction". For a "faction" submission, if a single unit fails, the remainder of the "faction" will be withdrawn. c) Choose a group of units (more than one but less than the total number of submissions) to be the "primary" group and the remainder to be the "secondary" group. The "primary" group will be considered as a "faction" under Section 1-1b, and the "secondary" units will be considered as "secondary" units under Section 1-1a in relation to the "primary" group. d) All units stand or fall on their own merit, as if they were separate nominations. Like the new rule! Thanks. I love the new idea. Gives players a chance at enjoying new army types, which HS explored in a few ways (Ashigarus, Elf Wizards, Wyrmlings, etc). Awesome ruling! It's definitely time for it, too. However, I have a question about this: Say a designer was to create a pair of units. They both work with each other, but they both also work just as well with previously existing units. For example, I have plans to make an orc rogue squad with rogue bonding. I also wish to make an orc general who gives rogues an ability to move after attacking. Both of these units would work with already existing units and each other, making neither necessarily "primary" or "secondary", and not a "faction" either. Would the creator be able to submit them both as "primary" units, so they could be tested with each other, or would he or she have to submit them one at a time? One of the perks of the new rule is that it doesn't try to fit all the factions that might be developed into the same mold. It's intended to ensure balance of all factions, while not judging some types too strictly (i.e. turning down Kurrok because an elemental wasn't balanced). And as an emphasis, the submitter (hopefully in communication with the designer) gets to choose which sub-process the units will go through. EDIT: @Maklar the Silver Prince : would you want one to pass if the other failed? that's the important question. If so, we'd probably consider them under section 1-1d, but tested together. If not, they'd go under 1-1b. Whoops. Didn't realize 1-1d was an option, I thought it was just a restriction or reminder. I'm nominating Superfrog and I's joint custom, Urk, for SoV consideration. Balance: Urk stands before the Goblin Cutters as both a cheerleader and a bold Commander. With him priced at 65 points you can fit him in almost any Cutter army with ease. Playability: Urk mainly circles around the Goblin Cutters, he helps them mainly by dispatching them in the early game, giving the squad a good head start against the enemy; with a solid limitation to his Mob Swarm ability balance can be detected easily. 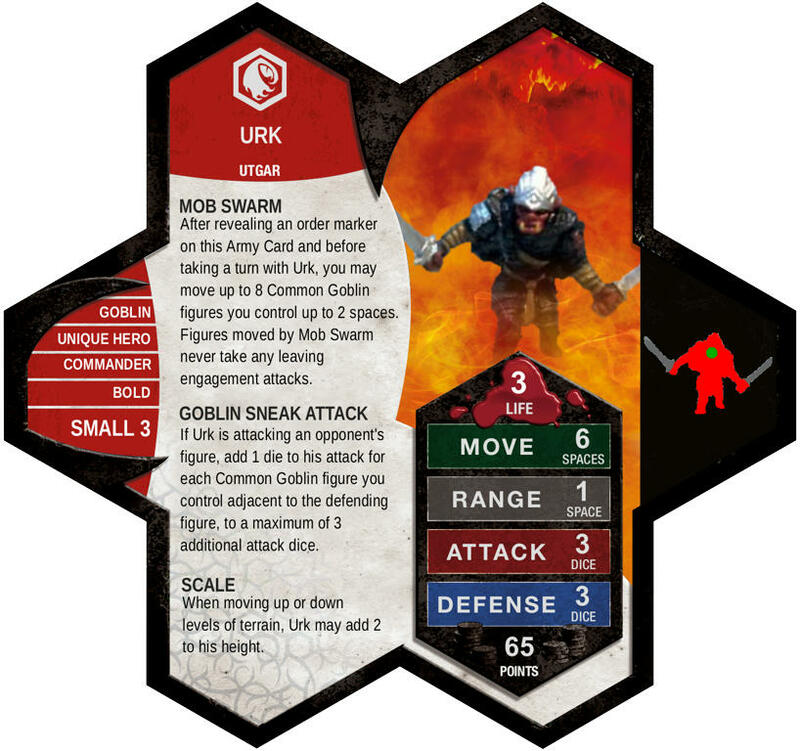 In the playtest games he was involved in, Urk boosted his fellow Cutters substantially and in addition, survived on his own a few rounds with the help of his Cutters who contributed to his Goblin Sneak Attack ability. Creativity: With two of his three powers being unique, Urk generates a good reputation as a Goblin Commander. He has the ability to dispatch the Cutters throughout the game while also covering himself with Goblin Sneak Attack (a riff on an existing power). Theme: An armored dual-sword wielding goblin could easily find himself a home in Utgars forces. The miniature stands well with his skittish friends and looks rather menacing. Availability: The figure used is the Silent Wolf Goblin. Superfrog and I found 121 total. The miniature is highly available on both eBay and Auggies. That is a much more restrained card. I'm willing to try it out.